DAVIS-Come early and stay late. Men, if you’re looking for a weekend full of fun, fellowship and inspiration, circle the dates of April 25-26 on your calendar for the Oklahoma Baptist Men’s Retreat at the Falls Creek Baptist Conference Center. Focusing on II Cor. 3:18, “But we all, with unveiled face, beholding as in a mirror the glory of the Lord, are being transformed into the same image from glory to glory, just as by the Spirit of the Lord,” and using the theme, “Rewired,” the retreat will be an outdoorsman’s delight. From the roar of 500 horsepower motorcycle engines to the style and grace of a single steed, and outdoor legacies demonstrated through fly fishing and birddog training, the retreat is designed to spiritually challenge and encourage men to have an encounter with God through adventure, worship and interactive teaching. 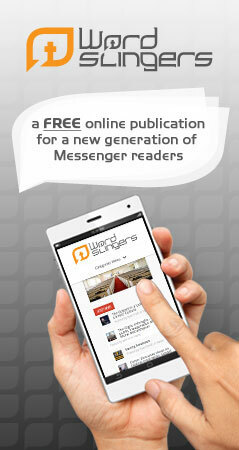 “Rewired is an opportunity for men to develop relationships with other men while learning spiritual truths that can be applied at work and at home,” said Keith Burkhart, family and men’s ministry specialist for the Baptist General Convention of Oklahoma. _ F.A.I.T.H. 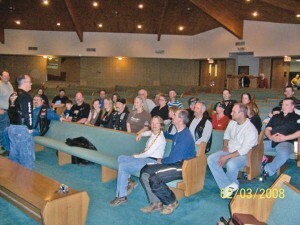 Riders Motorcycle Ministry, featuring founder Buddy Newsome. _ Sermon on the Mount, featuring Lew Sterrett, who will work with untrained to seasoned horses while teaching leadership and followship skills. _ Outdoor Legacy, featuring demonstrations by ESPN’s Gold Medal Fly Fisherman Chuck Farneth. _ A Man and His Dog, featuring Steve Harris, who compares the relationships between a dog and trainers with that of a man and God. In addition to the special venues, the featured speaker at the retreat at 8 p.m., Friday is former University of Oklahoma All-America running back and Super Bowl winner with the San Francisco 49ers, Spencer Tillman. Also, Del City, First Southern Pastor Tony Lambert will be a guest speaker Saturday morning at 11. Saturday afternoon activities include a special “Daring to Live” session at 1:30 with Sterrett, who will train an unbroken colt, a scenic motorcycle ride, ropes course activities and trout fishing. The retreat concludes at 5 p.m.
Burkhart said about 100 volunteers will help stage the retreat this year, including some 40 cowboys from area cowboy churches who will set up a cowboy camp around Sterrett’s horse venue complete with a church wagon and holding horseshoeing demonstrations, roping demonstrations, roping dummies and reciting cowboy poetry. Music will be provided by the Brad Henderson Band, and Friday evening will conclude with a special bonfire and Bluegrass “jam session” at Price’s Falls. He added that participants would be wise to bring camp-style folding chairs with them to the venues because no permanent seating exists at the sites. Burkhart emphasized that the retreat, which is made possible by gifts to the Cooperative Program, is open to boys 13 and older. “It is crucial for men to invite their sons and other young men into a God-centered manhood experience such as this,” he said. 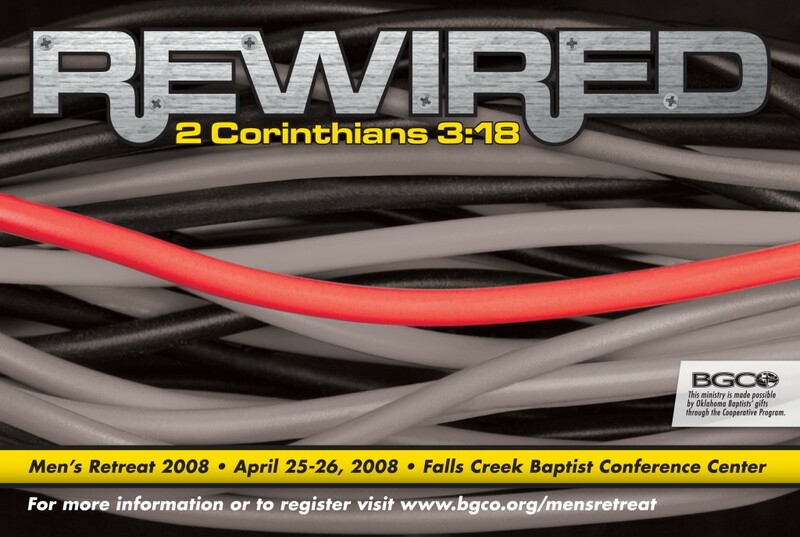 Burkhart said he hopes the impact of the retreat is carried home with each registrant, who will receive a special “Rewired” 6-week, small group discipleship study course from Man in the Mirror to take home with them. For more information, call Katie Null at 405/942-3000, ext. 4645.